In many parts of the world such as Japan and Hawaii, it is customary to take off your shoes before entering a home. In fact, our relatives reside in Hawaii and we fortunately, have adopted this principal while visiting and also in our daily life at home. It requires a little investment of time, but the rewards are priceless. DID YOU KNOW? A study by the University of Arizona found about 60% of household dust comes from outside and is primarily brought into the home from the bottom of shoes. These contaminants include arsenic, lead and DDT! 1. The study above revealed that dust is typically a combination of particles of shed human skin, animal fur and dander, food particles, furniture and clothing fibers, tiny dead insects, dirt and particulates from cooking, heating and smoking. However, it is the significant levels of three serious contaminants discovered- arsenic, lead and DDT – that presented a huge wake up call. 2. When we walk through our homes with our shoes on, we often don’t consider where our feet have traveled through today, and what have they picked up. It is important to bring as much clean air into your home as possible, but you definitely do not want to bring in the dirt, garbage, pet waste, bacteria, pesticides and heavy metals that you may have stepped on throughout the day. People sit on those floors of yours. Pets sleep on them. Babies crawl on them. 3. Any toxins you track in lodge into your carpet fibers and gradually join other particles of house dust, biological and chemical contaminants that are released back into the air you breathe. No wonder Asian families have a tradition of removing their shoes at the front door and putting on “indoor” footwear instead. This isn’t a cleanliness issue; it’s a health issue. DID YOU KNOW? Tracked in remnants of pesticides and lead dust can remain in carpeting for up to 20 years. Set up a comfortable place to sit near the entrance to your home where people can exchange outdoor shoes for indoor shoes and implement a storage rack or designated area where shoes can be placed. Having a place to put outdoor shoes when entering will help develop a healthy family habit with the extra bonus that it will reduce the time and products you need to clean your home. Utilize a bagless vacuum cleaner with a HEPA filter. These filters are designed to remove the smallest of particles, reducing the total amount of airborne contaminants that can remain in carpets and upholstery for years. Regularly replace your homes’ heating and cooling system / furnace filters. The EPA recommends replacing these once every 3 months; or, once per season. Utilize a portable air purifier for you bedroom or home. You can also track in some nasty viruses and bacterias from your shoes, as well as parasites, depending on where you’ve been walking. People seem to have a mindset of “If I can’t SEE it, then it’s not there”. On the contrary. 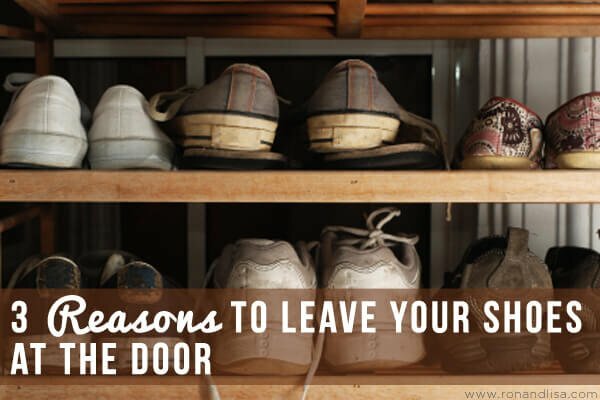 Leaving shoes at or outside the door is a smart thing to do and only takes a moment. Also, wipe your pet’s feet as well, they track in a lot of stuff too. Thank you for the suggestion of wiping your pet’s feet also. This is often overlooked and can be an hidden source of not only bringing in biological contaminants, but chemicals as well. There are pet wipes available at many pet stores which are a good idea (especially after a rain or for travel), but we’d advise avoiding any with synthetic fragrance chemicals. Or, some have even teached their pets to wipe their own feet! Check out little Winston who has this down pat! Thanks for this info! I will for sure be buying us all some slippers! En……Thank you for reminding，I will leave my shoes at the door. Absolutely! Be green & be healthy. thanks for your sharing! !I really like it !! Yes, no multitasking! Absolutely and thanks for dropping by.